Being in a car accident is always a trying ordeal. Whether you’ve been in a fender bender in a parking lot or a multi-car collision on the 403, the following dos and don’ts can help you to properly deal with the aftermath of a motor vehicle accident. Remain Calm. There are undoubtedly a thousand things rushing through your head immediately following a motor vehicle accident, but the first thing you should do is take a deep breath and try to remain focused and composed. Stop. It is imperative that if you are involved in a collision that you stop your vehicle as quickly and safely as possible. Call 911 if: anyone is injured, the damage to vehicles appears to be over $1,000, or you suspect an involved driver to be under the influence of alcohol or drugs. Follow the emergency operator’s instructions and wait for police or paramedic assistance. Document. Use your phone or camera to take pictures of the collision site and vehicle damage. Also jot down as many details about the situation as possible. Move Your Vehicle. If it is safe to do so, move your vehicle out of traffic. If it is not driveable, put on your hazard lights and use flares to signal your situation to other drivers. Exchange Information. Be sure to get the name, address, insurance information, phone number, licence plate and drivers licence numbers of each other driver involved in the incident. Additionally, get the names and phone numbers of any witnesses to the crash. Report. 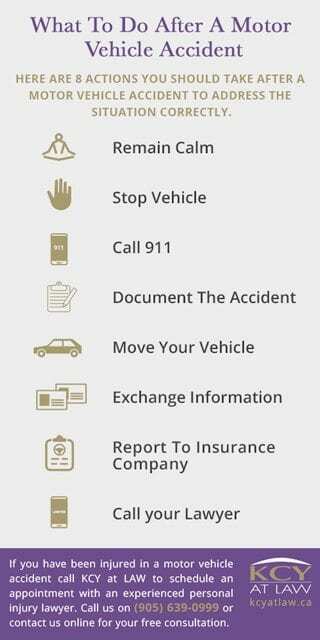 You must also report the accident to your insurance company as soon as possible whether or not you were at fault. Call your Lawyer. If you have been injured in a motor vehicle accident it is important that you contact a personal injury lawyer that can help you to get the coverage you deserve. You can call KCY at LAW and we will get the process underway on your behalf. Bonus: Be prepared for emergencies on the road by equipping your vehicle with a first aid kit, warning triangles or cones, and accident worksheet. Move an Injured Person. You may unintentionally cause further injury so wait for paramedics. Argue. Save your breath and resist arguing with other drivers or passengers. Stay calm and share your story with police when they arrive. Offer to Cover Damages. Never assume liability at the scene of the accident. Wait to speak with your lawyer. Accept Payment at the Scene. If you are not at fault, accepting a cash offer may be tempting but reporting the accident will not affect your driving record. 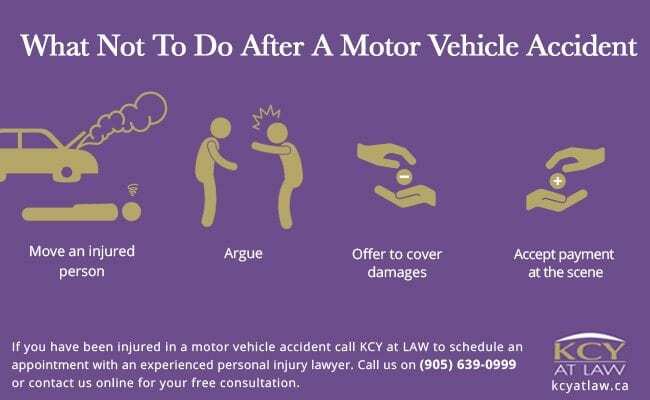 If you have been injured in a motor vehicle accident call KCY at LAW to schedule an appointment with an experienced personal injury lawyer. Call us on (905) 639-0999 or contact us online for your free consultation.